Thelma Bernice Kerr-Thomson was born in 1922. The first female lawyer in the British Empire, Clara Brett Martin (1874 – 1923), was called to the Ontario Bar in 1897. Twenty-two years later, a mere 11 women had followed in her footsteps. By the end of the 1920’s, the total had risen to 68. In 1927, three women graduates took an amusing look at the future of women lawyers sixty years from then––“when only a few stray men would be called to the Bar and when all the judges would be women!” In the 1930’s 37 more women lawyers were added to the fold. In the 1941 census there were 8,621 male lawyers listed in Canada, women numbered 129, and 112 of them were from Ontario. Thelma’s father was well ahead of the times––“Can girls be lawyers, Father?” And his answer was: “Why not, my dear?” Her father encouraged Thelma to follow that path. In 1942, she entered the University of Toronto Law School. It was a tumultuous time for all students in the early 1940’s, because of the war, but especially so for female students. Thelma, during her university years, was active in the creation of an International Club for foreign students. 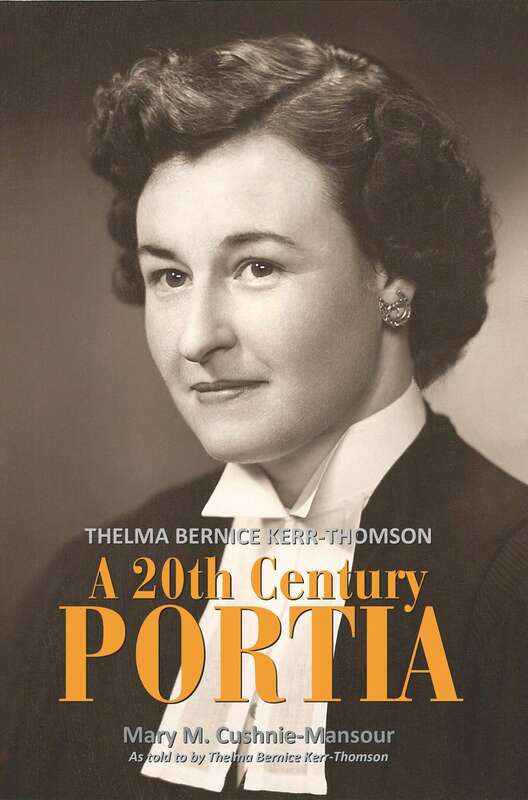 In 1946 Thelma entered Osgoode Hall and in September 1949 she was admitted to the Bar. Thelma married fellow student, David Moffatt Thomson, and together they set up a law practice in Lindsay, Ontario. She was the first female lawyer in the area. Thelma’s story takes us through a time when women were expected to stay home and tend to the family––when those who stepped out into the “man’s world” were faced with prejudices, not just from males, but from women, as well. Thelma rose above it all––her endearing story of shuffling a law career and a family will enlighten the minds and warm the hearts of any reader–– a female pioneer in law––an inspiration to all! The many phases of Thelma’s life – her love for horses, her graduation from the University of Toronto Law School, to her Bar Admission; her marriage to David Thomson, to her children and her grandchildren – Thelma loved life and all those around her! She was and will remain, a true inspiration to all who have known her personally and to all who will be fortunate enough to read her story.